Not very often does the Wiki do news related type things, and really this was more about archiving perspectives. Anywho, Mrmichaelt did a interview with Erik Burnham. He covered a pretty good part of the run in the 32 questions that got answered. Neat and informative. Thanks for bringing this to us. And so... Part II is here. Covers all 20 issues of Volume 2. To quote Erik on Twitter: "That was one thorough set of questions! lol". Interview conducted by Ghostbusters Wiki's very own Mrmichaelt. If you easily "TL;DR" then stay away. 12. The Draugar and Grendel became a personal story for Janine. Then there was the kiss, you must have gotten some great positive feedback for that alone. More along the lines of irritation – the E+J shippers were bummed there wasn't more, and the anti-shippers were bummed it was there at all! But romantic or not, Janine has an attachment to Egon. She has an attachment to all four of the guys, but Egon was the one she started with a crush on… and she was relieved to see him alive. 18. 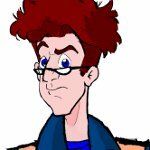 With Roger pointing out Janine's attraction to Egon and his response with being too busy saving the world at the time -- was this issue your definitive statement on the Egon-Janine romance sub plot? ERIK BURNHAM: I've gone back and forth on it – right now, I think it may be better to steer clear of doing anything definitive on-panel, yea or nay. No matter what I do, half of the audience will tell me that it's unequivocally wrong! And that's not even factoring in Sony’s wishes; if I set up a relationship and they wanted it reversed to status quo, well, that would be a mess. Lol. Half the comic's audience are anti-E/J? That's news to me. More like a couple of Egon stans who like sending freaky emails to people who write comic books. However, if he does manage to get those two crazy cats together you can guarantee I'll be a Burnham fan for life. I don't think it'll ever happen, but the offer's there. And that's not even factoring in Sony’s wishes; if I set up a relationship and they wanted it reversed to status quo, well, that would be a mess. But isn't that exactly what he did with Winston and Tiyah? 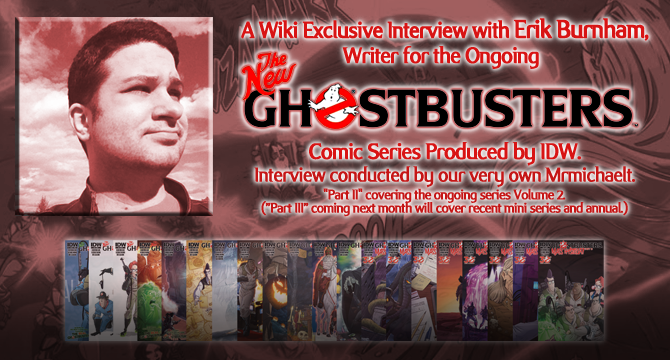 The third interview, covering TMNT/GB, the Get Real arc, and the 2015 Annual. 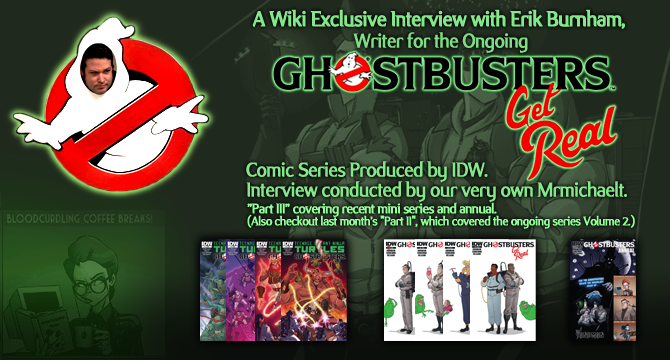 Interview conducted by Ghostbusters Wiki's very own Mrmichaelt. "who knew throwing a paperweight at a god would have such ramifications"